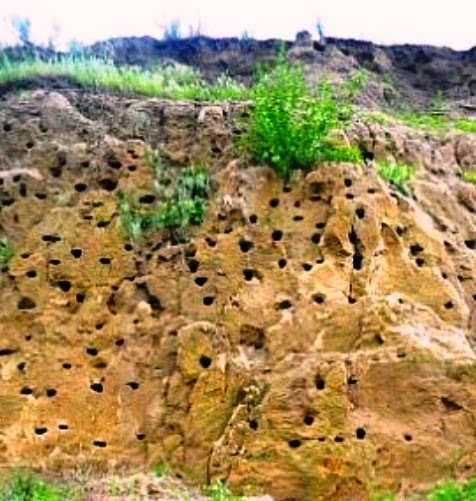 Dear reader in our last post we have discussed about dune sand as an Aeolian deposit. Here we will discuss about another wind transported soil, loess. We have introduced this soil in our previous post regarding collapsible soil. The distribution of grain size is as usual uniform more or less like dune sand. But they are distinguished form dune deposit as it consists of silt or particles size identical to silt. This soil shows cohesion which is mainly a contribution of coating of clay over particles of silt or similar size grains. Thus this soil remains stable unlike dune deposit; but there have a condition. This is soil must be in unsaturated condition more precisely a dry soil. Some chemical leached with rain water also precipitated in such soil which contributes to cohesion to some extent. These soils have collapsible nature. When it gets saturated, the stability stated above collapsed, as binding strength remains between soil particles is lost.